I was looking over the internet the other day and came across a Christmas wreath that I loved. I decided to be a copy cat. The original post is here. But here is what I created. Burlap is a cool look. It was a bit messy to work with, and you have to be careful that you don't just cut it without first pulling a thread from the weave so you can see exactly where to cut because it is usually woven pretty wonky. Plus, it's a bit dusty and smelly. (I am really selling you on this, aren't I?) But oh, so adorable. The flowers are just a larger version of the ones I made for my ribbon rose tutorial. Here is what I did. I took about 1 1/4 yard of green burlap and cut it into 3" strips. I then took an old wire coat hanger and formed it into a circle. Taking one end of the wire I accordion folded the strips onto the wire. 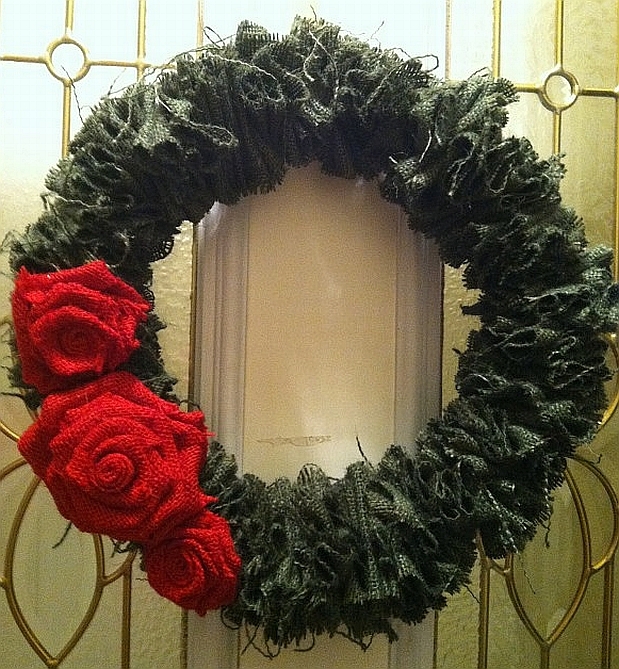 I smooshed it on there pretty tight because I wanted my wreath to be really textured and not so loopy looking. (if you follow that other link above, you will see what I mean) But whatever you like! Once it was all crammed on there I twisted the circle closed. Then I cut a strip of the red burlap to create the roses. Following the same procedure as shown here. Kinda cute and festive, isn't it? It makes me happy when I look at it. Shelley as always your art amazes me!!! That's what the internet is for... sharing ideas! Plus you put your own twist on it. Looks great.